Golden Gate Highlands National Park is located in Free State, South Africa, near the Lesotho border. It covers an area of 340 km2 (130 sq mi). The park’s most notable features are its golden, ochre, and orange-hued deeply eroded sandstone cliffs and outcrops, especially the Brandwag rock. Another feature of the area is the numerous caves and shelters displaying San rock paintings. Wildlife featured at the park includes mongooses, eland, zebras, and over 100 bird species. 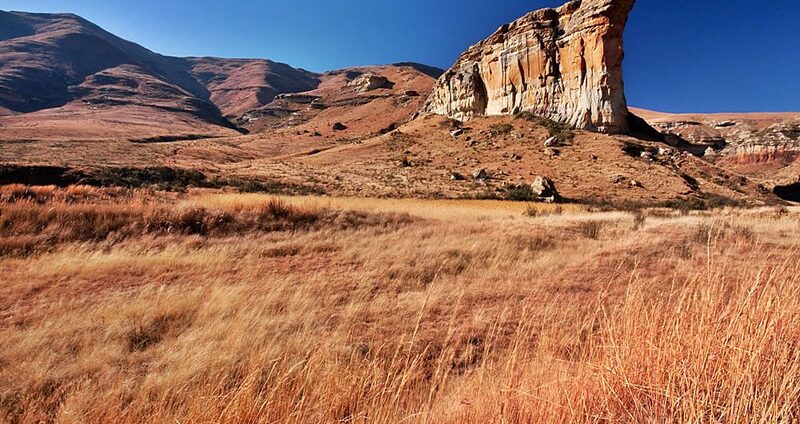 It is the Free State’s only national park and is more famous for the beauty of its landscape than for its wildlife. Numerous paleontology finds have been made in the park including dinosaur eggs and skeletons. – Witness impressive rock formations Nearby the Golden Gate Highlands National Park are breath-taking rock formations. It can also be your chance to observe and see rare species of birds at the Vulture restaurant. You can also enjoy some guided walks along the Cathedral Cave. – Sight-seeing Golden Gate Highlands National Park can offer you lots of amazing sceneries that you should have witnessed! Get in love with the beautiful horizons and overlooking lovely South Africa. Here is where you can experience fresh air and find a nice spot of relaxation. – Witness amazing wildlife Give yourself an incredible experience and close interaction with black wildebeest, zebra and other animals in the wild. – Witness fossils and Jurassic dinosaurs droppings Discover the remains and fossils of the dinosaurs that roamed around the plains many years ago. There are so much more to experience here at Golden Gate Highlands National Park. Authentic culture and traditions await you, too. Visit and get the best Golden Gate Highlands National Park has to offer!